There are 134 teams that have unsuccessfully attempted to quality for the FIFA World Cup Finals. 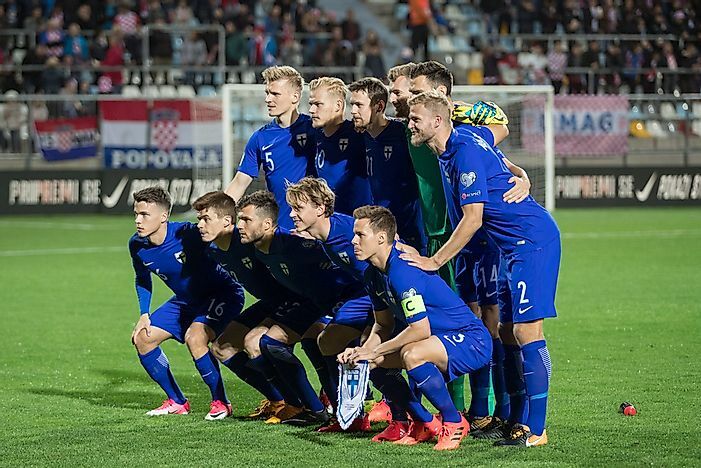 The Finnish national team at the 2018 FIFA European qualifier. Editorial credit: Ivica Drusany / Shutterstock.com. The FIFA World Cup is an international competition that is held after every four years. To qualify, the different countries have to field their teams against other members of an assigned group and battle it out. The groups are assigned to the countries by the governing body, FIFA. Obviously, for the nations to participate in the qualifying stage of the World Cup finals, they have to be members of FIFA. Currently, there are 134 teams that have never qualified for the World Cup finals. The Luxembourg football team has had the most attempts on this list with 20 qualifying attempts. The first attempt came all the way back after the first World Cup in 1934 with the most recent attempt happening in 2018. One of the reasons that they have failed to qualify continuously has been the lack of experienced and star players within their ranks that can galvanize the squad when they need it the most. The strikers have also not been delivering at all. In their latest qualification attempt in 2018, they managed to score a total of only eight goals. With such worrying trends that go back as far as the first time they ever tried, it is unlikely that Luxembourg will compete in the World Cup finals in the near future. Second on this list is Finland's national team with one less attempt compared to the Luxembourg football team. In the 2000s, Finland may have found the solution to their qualifying problems after going for Roy Hodgson as manager. Roy led the Nordic team to a historic ranking of 30. Unfortunately, this ranking is something that they have never been able to replicate. If they are able to go for another top manager, then they may stand a realistic chance of qualification. If they need inspiration, they should only look to underdogs such as Iceland in the 2018 World Cup finals. Syria is a surprise on this list with 14 qualifying attempts. The most recent one came in 2018 despite the political instability in the country. Even more surprising is the fact that the closest they have ever come to qualification for the finals is in 2018. The war even threatened to derail their qualification attempts after they were prevented from playing home games within the country. Were it not for Malaysia offering to host them, they would have been disqualified. This team has made the most attempts, 13, among African countries. Despite three appearances in the Africa Cup of Nations and winning it once in 2012, they have never made it to the World Cup. However, the team has showed promising signs of qualification in recent years, showing that 2022 may just be the year for Zambia to make it to the World Cup. The 2018 World Cup final were held in Russia over a 32 day period from June 14 to July 15, 2018. The 2022 finals have been slated for Qatar while the 2026 ones will be hosted by three countries: the US, Canada, and Mexico. Which Countries Have Hosted the World Cup?